Take a look at Quincy Capital Partners’ family of white papers. These powerful, timely and important topics of interest make the case for taking a consultative approach to presenting investment themes and portfolio solutions. PREPARING YOUR PRACTICE FOR GROWTH How better reviews, evaluation, segmenting and implementation can increase sustainability and build revenue. If not now, when? 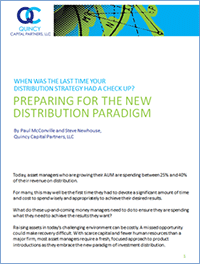 Share with your colleagues, and join the enlightened movement to optimize your distribution potential.